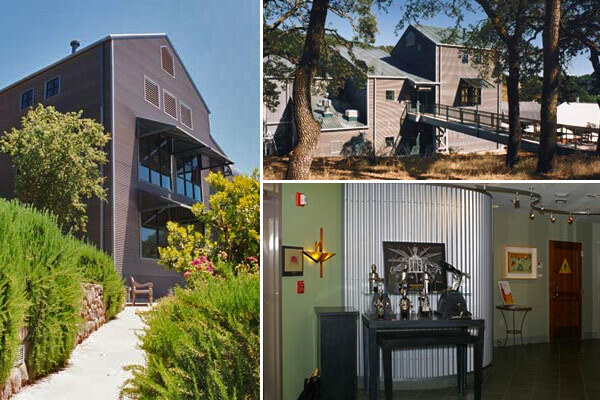 Designed as a brewery and later converted by the client into a winery for their premium line of wines, this winery/brewery facility and its associated hospitality structure are nestled in the oak trees around an outdoor seating courtyard. This project required very precise design coordination to accommodate the brew kettles, piping and valves that were imported from an existing brewery in Germany. The original brewery design concept showcased steel in all facets of the structure to facilitate maintenance, control construction costs and present an aesthetic image in keeping with the client's wishes and the surrounding rural farm structures. A steel bridge extends from a public pathway to the upper level of the main building. The hospitality structure includes a retail area, commercial kitchen, dining room and bar. The facility received a national design award as well as local notoriety.